@Chip-Valecek These pieces feel very strong. From a very young age, I've loved scary stories and movies and these pieces celebrate that inclination. Of all the pieces, the 3rd one is my favorite because it's gleeful and funny with many elements of evilness--pure fun. Someone mentioned that these pieces would be perfect Halloween-themed pieces and I would agree. There are lots of spooky books for children! Some kids love that kind of thing. You can show a lot of fear and tension without ever showing blood. 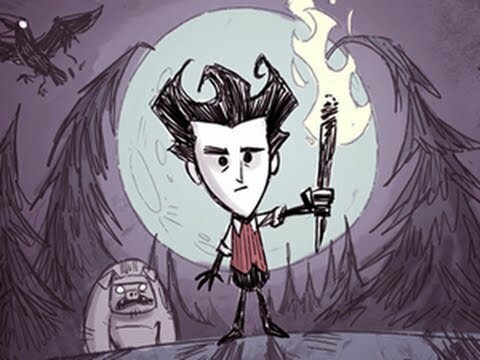 Your art reminds me of a game I enjoy called Don't Starve. The artwork has scratchy line work that gives the game a more spooky ambiance. Take a look at the way the artist uses line and muted color to give the story it's spooky feel without showing blood or gore. Above all, just draw what you love. The market will find you as long as you share your work openly. I like your pictures. I think you could push the colours a bit more to give them a cleaner vibrancy. Also with your fan art of Negan I would try and get a likeness that you can simplify enough but still keep the facial likeness. I'm no expert on childrens books but I think they might need making more friendly if that is your market. Something else I have recently thought about is who is your exact target customer and what is the precise purpose for your pictures. I think if you plan a project for your designs they will become tailored to that project and thus have a home. Just my thoughts as I personally was doing art that wasn't really me and I enjoy myself more doing what I do now. @Jason-Bowen I dunno I think it looks more like Negan than the Walking Dead TV show does! @Coreyartus @Chip-Valecek This has been a great read, thank you both. I'm not going to tell you my age, but I'm most likely the oldest SVS student. I'm approaching this as a second career, better late then never and I'm frustrated every day. Some days I wonder why I'm doing this, but it seems drawing and creating isn't a choice. Chip, finding your own style and staying with it seems to be the greatest challenge. I agree with Corey that finding the right consumer for your art is the real challenge. The advice throughout the thread has been great and your horror stuff, especially the the black & white Horror Paintings on your instagram feed are brilliant and terrifying. I'm halfway through the licensing video and as Whitney says, it's a viable way for illustrators to supplement their income. The halloween might be a good fit for your work. And thank you Chip for doing the slideshow for each month, great way to see all the entries. Hey Chip, I really like your work and I think you have a lot of potential with your style. I'm going to give you some feedback (I haven't done this in a while) so I hope it doesn't annoy you. I think you could develop your character designs and style a bit more. I like the wide eyed style characters and I feel if you pushed into that more you could really build a unique look and style. The characters could be looser and you could work on making more dynamic poses. I also feel that you could play with colour more. I still buy a sketchbook and stick in colours I find like from menus, books, magazines and build your own library of colours. It ends up like a swatch book of colours that I pull from when colouring in Photoshop. I'm trying to avoid doing fan art or copyrighted characters for 2019. I've done a few in the last couple of years and honestly I feel its restricting me creatively, compared to making my own designs and concepts. I think your work, if toned down a little, could definitely work for the YA market. And I agree with comment above about tapping into the Halloween market - things like Stranger Things, Sabrina and similar shows are so popular now there is definitely something you could tap into! Continuing on with my journey, here is a HipHop Unicorn done for the jimbobdrawingshow. Onto my Love piece. @Chip-Valecek Puts a smile on my face, thanks!